If your current garage door opener is too old or starts malfunctioning, it is time to have replaced it with a new one. The good news is that modern openers are more efficient, reliable and durable than any previous model of the past. The even better news is that there are plenty of models for you to choose from. Although the variety may seem daunting at first, our experts can help you find the perfect one for your particular needs. Here are a few of the main features and characteristics you'll want to consider. The first thing to consider when looking for an opener is that its motor is able to produce a sufficient amount of horsepower. Most two-car garages are best served by an opener that is able to produce at least half a horsepower. 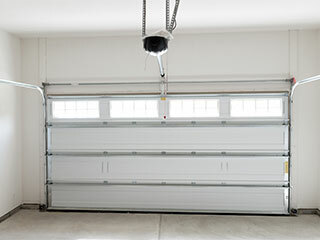 Garages with heavier doors such as carriage house garages require an opener that can deliver three-quarters of a horsepower. Generally, knowing the correct horsepower output for you will depend on the size and weight of your door. It's crucial that your opener is more than capable of handling your door's weight and dimensions. If it struggles to do so, the breakdown will be inevitable. You should definitely consider an opener that comes with a backup battery system. This is an extremely valuable feature. It will enable your opener to continue to work during sudden power outages. That way, your car will be readily available for you to use in case of emergency. There are two advanced security features to look for. You should consider getting an opener with rolling code technology. This technology allows the system to change its codes automatically after each use, which gives you the maximum possible level of protection, and prevents any would-be intruders from "code-hijacking" your system. The second feature is a keypad control panel. This will eliminate the need for you to use a key in order to operate your garage door from outside. It offers a great deal of convenience while also ensuring a higher level of security. The safety reversal mechanism has become a mandatory feature of every opener model created after 1993. It forces the door to automatically open back up if the system detects an obstacle blocking its path. Needless to say, it's an invaluable feature. Contact our team at Garage Door Repair Atlanta to have our experts help you choose the perfect opener for your home.